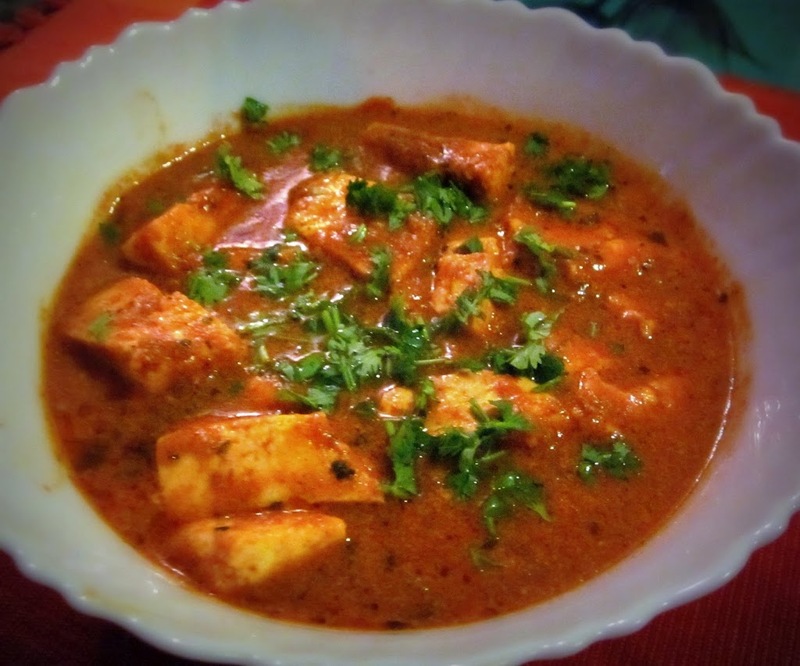 Kadhai Paneer is one dish you will get in most Indian restaurants. 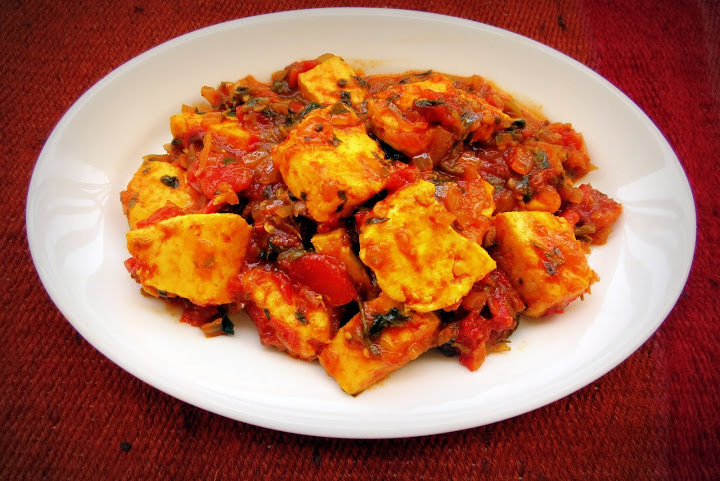 I like the combination of bell peppers with paneer. 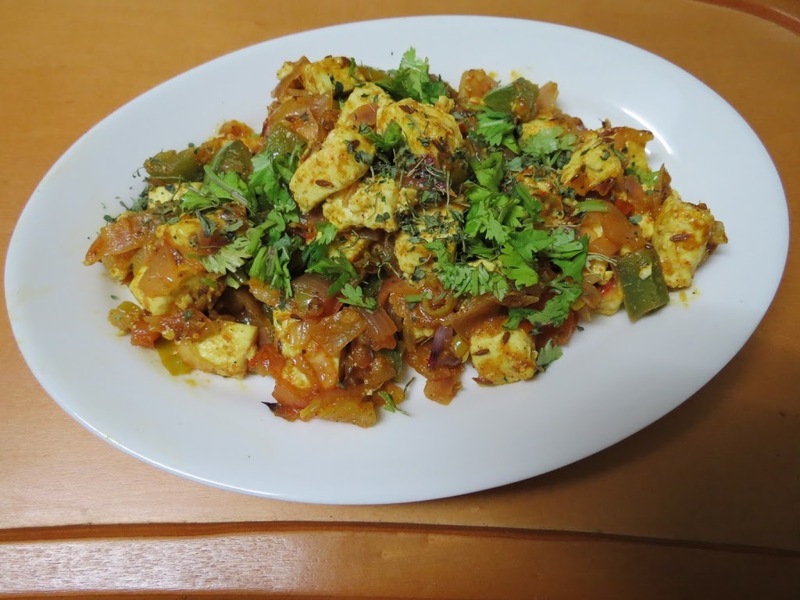 Add to it the flavors of kadhai masala, and you have a delicious side dish for a vegetarian meal. 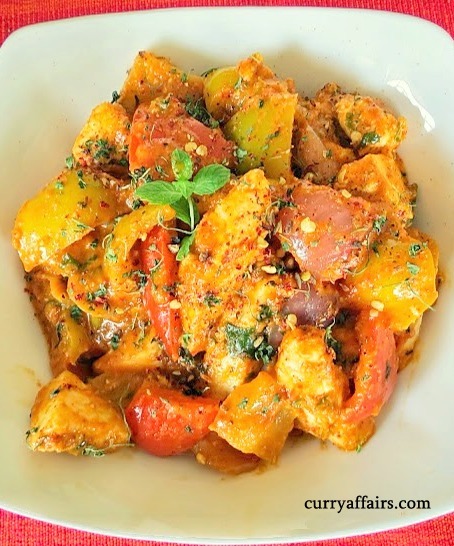 The spice mix in the recipe gives it a unique rustic taste. 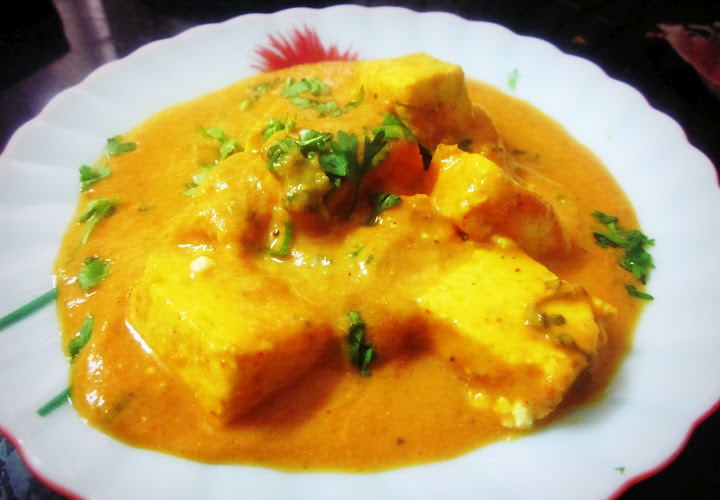 Here is my recipe for Kadhai Paneer. Heat a pan. Dry roast 9- 10 pepper corns, 5-6 dried red chillies, 1 tsp coriander seeds, 1 tsp cumin seeds, 1/2 tsp fennel seeds till the kitchen is full of the aroma from the spice mix. Add a pinch of fenugreek leaves (Kasuri methi) and saute for a few secs and then let the spice mix cool down. Grind it to a coarse powder. Keep 2 tsp aside for garnishing. Heat 2 tsp of butter in a pan. When the butter melts, add half of the above powder mix and fry well. Add 1 onion cut into cubes into the pan. Fry it for some time and add 1/2 a red bell pepper and 1/2 yellow pepper. Fry well. Blanch 2 tomatoes and then puree them and add it to the pan and cook till the raw smell of tomatoes goes off. Then add 1 tsp chilly powder, 1 tsp garam masala powder, salt to taste, pinch of sugar, and mix well. 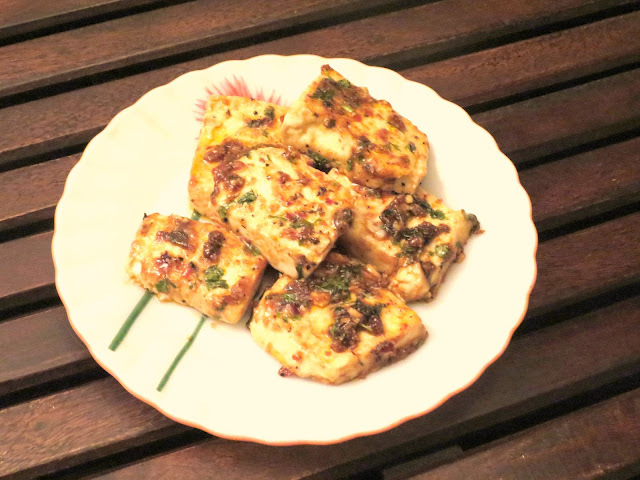 Add 250 gms of paneer cubes and mix well. 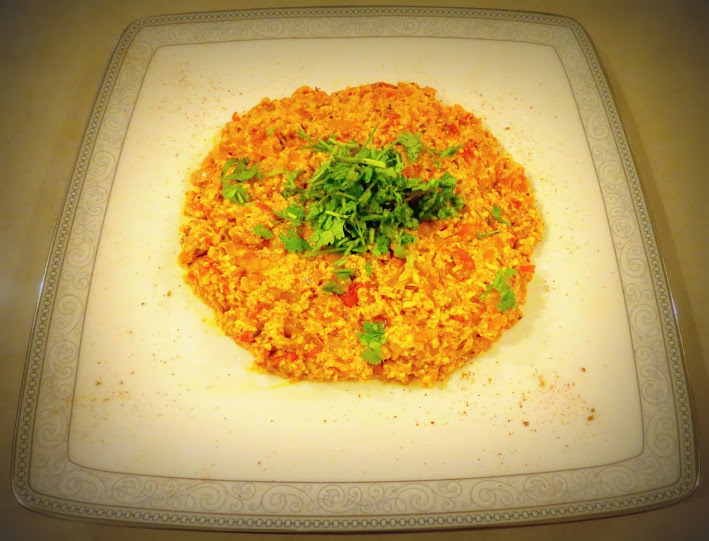 Sprinkle 2 tsp kadai masala and add pinch of crushed kasuri methi and mix well. You can add cream and coriander leaves too but I skipped it. Was a really good dish. Did not know that adding fennel seeds wld make such a difference. This same kadhai masala goes well with chicken too – I think there is something about this spice combination which makes it irresistible. You can make this masala and store it for easier cooking.